Dr. Hailong Wang described the sources and consequences of soot falling on snowpack in the Pacific Northwest and around the world for a story that aired on Northwest News Network public radio stations. The soot, a result of incomplete combustion, is coming from sources such as vehicle pollution, carbon-fueled power plants, and forest fires. Because the soot absorbs sunlight, it warms just enough to cause increased snow melting. This can be a problem in regions that rely on mountain snow melt for seasonal water supplies to fill reservoirs and crop irrigation systems. 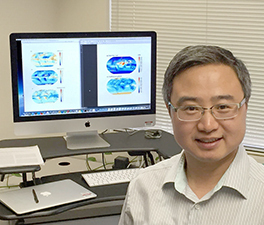 Wang led research to improve climate models accounting for soot falling on snowpack. Better models will help those who need to understand changes in seasonal fresh water supplies in a warming climate. Wang, a PNNL researcher since 2009, got his Ph.D. in atmospheric sciences from the University of Illinois at Urbana-Champaign. Recently, his research has focused on developing a source-tagging technique in the Community Earth System Model, to understand the relationship between global sources of soot and its impact on snowpack and glaciers at various locations around the world. Related highlights: The Down and Dirty About North American Snowpack; Playing ‘tag' with pollution lets scientists see who's it.